calling all street-chic chicas! to match that fabulous avant-garde, indie wardrobe of yours, you've got to have equally fabulous shoes! im not talking your usual run-of-the-mill slouchy boots, or bright day-glo flats. im talking shoes with personality like yours -- artsy, unusual, and a touch satirical. tashkent, one of the brands i've recently fallen in love with... is now on shopbop.com with their spring line! im still lusting for their crazy over-the-knee boots, but im also loving their summery take on the ankle boots (yep, theyre still sticking around). mmm.. now if only my wallet agreed with me... these shoes do not run cheap :( expect to fork out 300$-400$. eeek! I just went to check out tashkent on shopbop--you're right. they're frigging awesome! (esp. 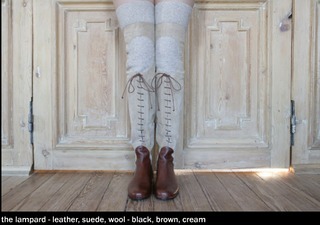 love the grey wedge boot). Thanks for cluing me into yet another fabulous item that is way too expensive! sigh. You are right. Shoes are awesome. Love it. Love those cut out boots. Very cool in an avant garde way. And the last pair are definitely drool-worthy. 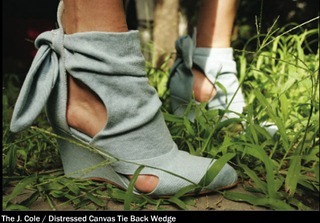 I love those peeptoe canvas wedges! Too cute! The second pair of ankle boots is fabulous. 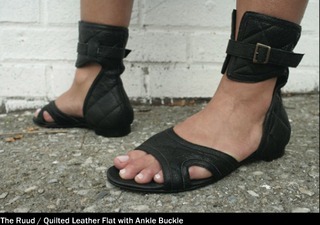 It's what Karl Lagerfeld keeps on trying to achieve with his crazy black and white shoes but can't quite get.